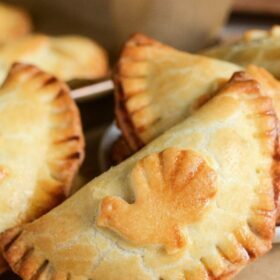 Creamy Turkey Hand Pies: warm flaky turnovers are stuffed with a delicious turkey filling made with herbs, gravy and vegetables and then baked until golden! Thanksgiving is still a few weeks away, but my turkey loving has only just begun. I know some people wait until Thanksgiving to start cooking turkey, but in my family we enjoy it much more often. After discovering the awesome way to cook turkey in the instant pot, we have been enjoying turkey almost every week. I had some leftover chopped turkey on hand last week and had an idea to make Creamy Turkey Hand Pies. The hand pies were perfectly golden and the little turkey and leaf pie crust decorations I placed on top looked adorable. I used the mini pie crust cutters my Mom bought a million years ago and a butter knife to draw the lines — couldn’t have been easier! Here are some similar Autumn Pie Cutters on amazon. 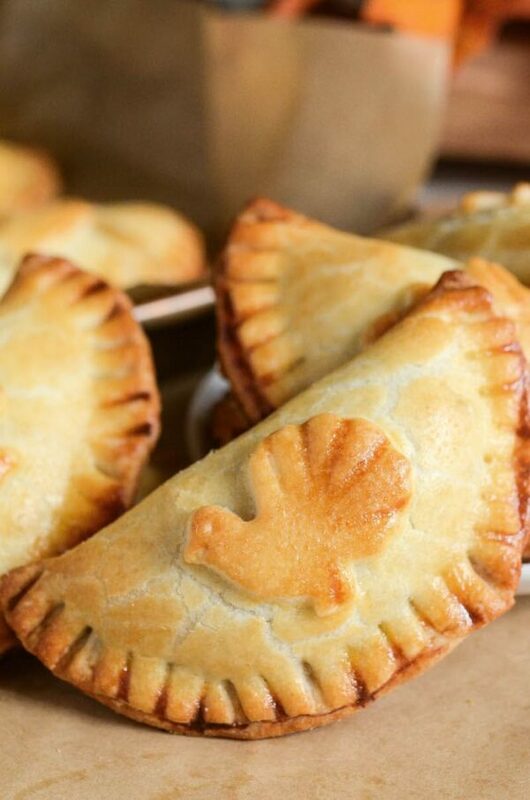 To keep my hand pies quick to make and full of unbelievable flavor, I used McCormick’s Simply Better Turkey Gravy! 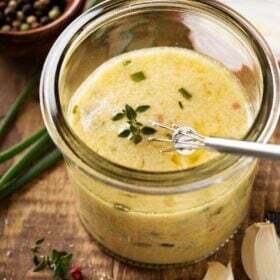 This gravy is my new favorite dinner helper for when I need dinner on the table quickly but don’t want to sacrifice on flavor. These McCormick Simply Better Gravies come in three awesome flavors: turkey, chicken and beef. They are all gluten-free, have no artificial flavors, no added MSG and they come with an easy-to-pour, re-sealable spout! I have used them on everything from turkey meatballs to salisbury steak. They are crazy tasty and are made with real ingredients, including stock and McCormick herbs and spices. It’s just simply better, like the name says! 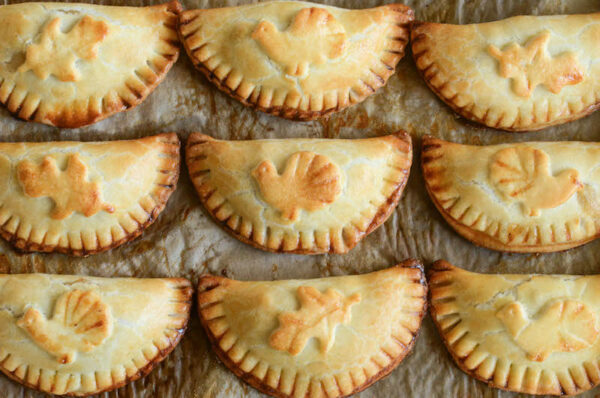 These Creamy Turkey Hand Pies are as easy as they are delicious. The filling is packed with flavor and it’s all wrapped up in a buttery, flaky, golden crust! They make an awesome lunch, a cute Thanksgiving appetizer, or fun hand held dinner. Bonus: the leftovers store great too. To reheat, I just wrap them in a paper towel and microwave them for about 30 seconds. 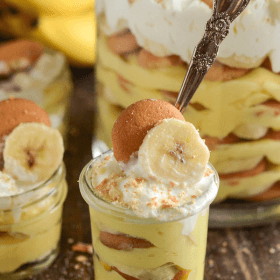 This recipe is wonderfully versatile and you can switch it up to fit your family’s tastes. We have made it with chicken many times and occasionally I will add different veggies like green peas or carrots. I hope your family enjoys these Creamy Turkey Hand Pies as much as mine does! 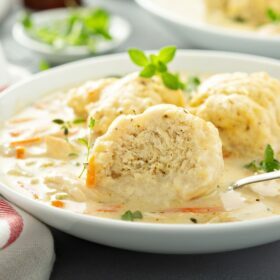 Click here to find Simply Better Turkey Gravy in your area! Preheat oven to 400°F. Line two baking sheets with parchment paper, set aside. In a large deep skillet or dutch oven, melt butter over medium-high heat. Add in onion, celery and mixed veggies. Cook until softened, about 7 minutes. Add garlic and sauté for 30 seconds. Stir in flour, thyme and pepper until well combined, continue cooking for 2 minutes. 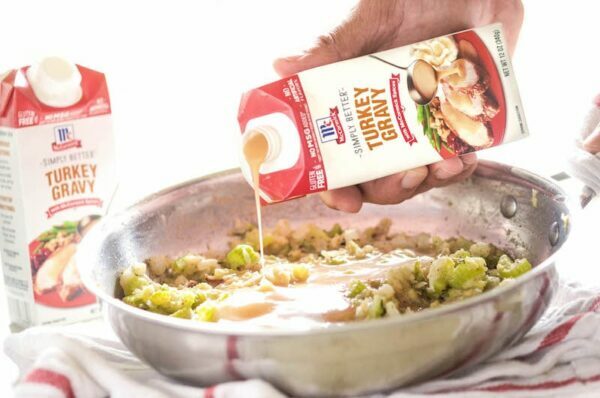 Slowly add McCormick Simply Better Turkey Gravy. 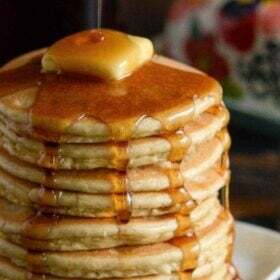 Let cook until thickened, about 3 minutes. Stir in turkey and remove from heat. Fill the pie dough circles with 2 heaping tablespoons of the turkey mixture. Fold pie dough over to create a half moon shape and use the prongs of a fork to seal the edges. Using a sharp knife, cut a small slit in the top for air to escape. Beat egg and water in a small bowl. Brush over the tops of each pie. Place on parchment paper-lined baking sheets and bake for 13 to 15 minutes, until golden browned. Remove from oven and let rest for 5 minutes. Serve warm! This post is sponsored by McCormick. All opinions are, as always, 100% my own. Thank you for supporting the brands that I love and that keep The Novice Chef running! 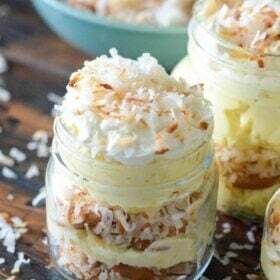 These are perfect for leftovers!! Love that gravy. 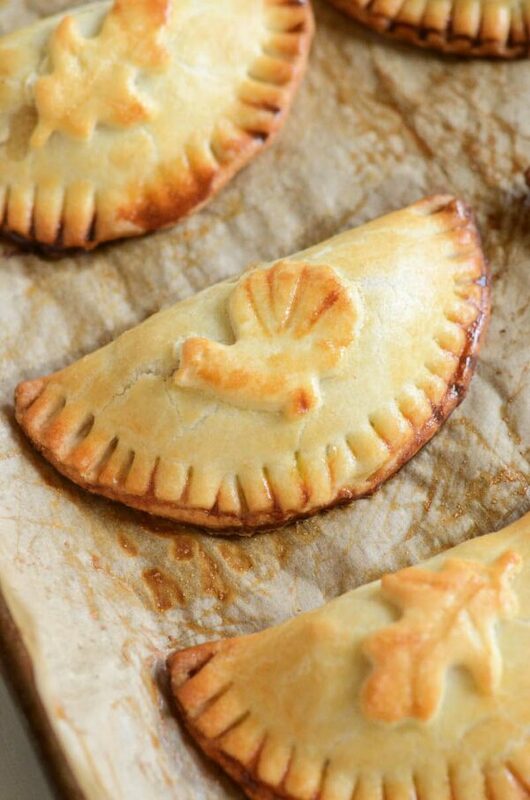 I just love the idea of hand pies! The decorations are adorable too! 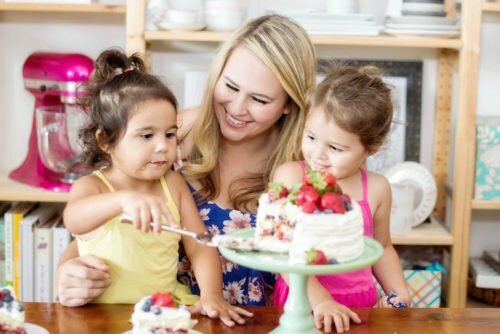 I love that is so easy and quick! This gets me so excited for Thanksgiving! Definitely doing this! Those are adorable, I love this idea! These are almost too cute to eat! But I know they’d go fast here! These sound really good, except the ingredients list doesn’t mention mixed veggies. How much? Frozen or thawed? Hi Juli! I didn’t add any mixed veggies to mine (just fresh onion, garlic and celery). 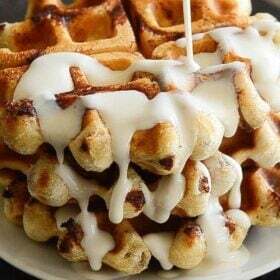 However, you can definitely add a cup to the filling! !